Finding a winter coat when you live in a warm weather climate is actually a pretty tricky thing! While everyone else has been obsessing over wool coats with fur collars, I’ve been looking for the perfect coat for the southern winter season. It needed to have more warmth than a raincoat, but also be able to work for 60 to 40 degree days. I also wanted it to have room to fit layers underneath in case it got below 40 for a week or so. 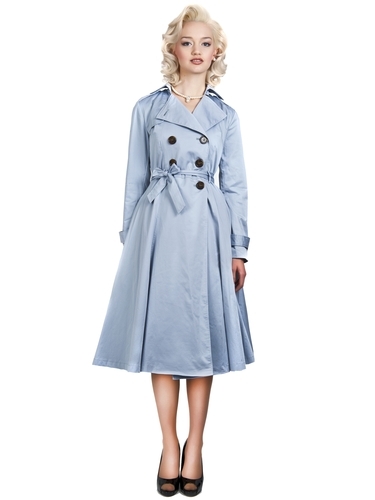 I spotted this coat on the Collectif site months ago, but sort of wrote it off as just another pretty raincoat. I rediscovered it on Modcloth and realized that it was lined and made out of a heavy cotton – plus, it was just too lovely to resist! 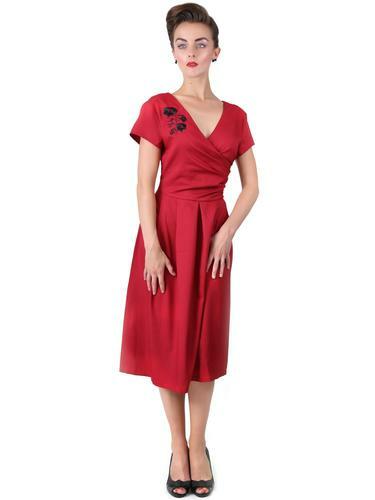 I’ve tried a dress from Collectif before and I’ve heard that their sizing varies widely between styles. 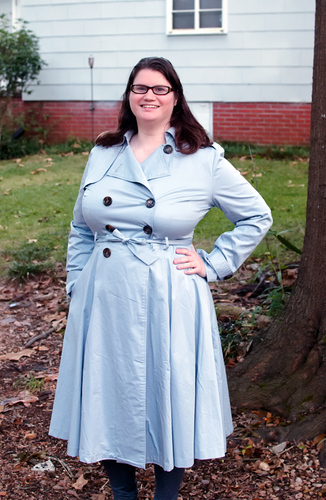 Seeing the coat on Modcloth gave me the confidence to take the plunge. If the coat didn’t work, free returns always beats return postage to the UK. I still need to steam it properly, but this coat is absolutely a winner. I love the light blue color as well as the figuring flattering details. This is the XL, which is a smidge tight on the chest but fits my waist perfectly. It’s a better fit than I get on most coats, so I’m willing to go with a slight amount of pulling to get such a great shape. If I unbutton the top button, it doesn’t pull at all. I’ll probably wear it with the top button undone and a pretty scarf for color most of the time anyway. This coat has an absolutely gorgeous floral lining that is silky smooth and adds an extra layer of warmth – I was shocked at how high quality and well made it was. While it wouldn’t work in a climate that gets a real winter, it would certainly get you through until the snow sets in. It will work wonderfully here with a cardigan under it for “cold” days. In general, all of the details on this coat are done right: cuffs and pleats are perfect, the skirt is poofy but doesn’t get in the way and the buttons are sturdy. From my limited experience, Collectif pieces are incredibly high quality and always a good buy. Collectif has released this coat in red recently, but it’s also available in beige and black. They’re also bringing in some gorgeous wool coats with fur details if you’re lucky enough to need that kind of thing in your life. While I know that not everyone is a fan of Modcloth, I think they’re a great place to try out Collectif due to their easy returns policy. I love this Phyllis Doll Dress as well, but I’ll probably only check it out if it shows up on Modcloth at some point. They do make it easy to try out international brands without taking the risk of being stuck with something! What coat will you be wearing this winter? What do you think of this one? Oh the RED one. Oh my goodness. Actually, I want every single red garment in this post– I really hope Modcloth carries them too, because I’d love to try them. It’s a fabulous coat, and you look lovely! I love red clothes! Red stuff is about half of my closet right now, which means I really need to start investing in other colors. I would have been severely tempted by the red version of this coat if it had been available though!